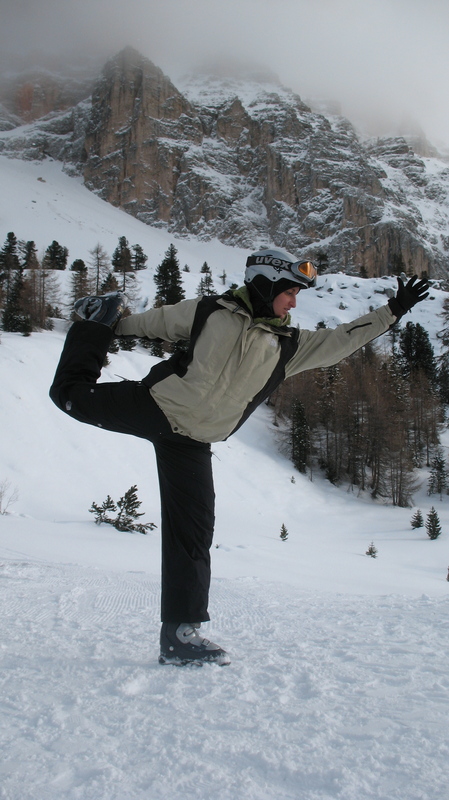 If you happen to have been skiing for a whole day and you feel a little tired and soar, why not stop for a second and strike a Yoga pose on your lunch break. Just make sure you do it before you eat otherwise forget about feeling better (trust me on this one). The weight of the boots may impede you to to do too much, but you can still opt for something easy, yet invigorating and challenging enough to keep you from focusing on that cute skiing instructor walking bye, like the King of Dancers Pose. First off, find a solid enough slot of snow, inhale big and then slowly pick up your right foot in your right hand. Stay up with the chest and keep gaze down in the beautiful, white snow. Make sure not to move the gaze too quickly otherwise you will lose your balance and the pose. For a better thigh stretch kick the foot higher and, if the boot allows, let the foot rest in your elbow crease. Remember to stay up with your chest at all times, though and never to hunch down, collapsing your lungs. If King of Dancers does not fit you, you may want to try, Hurdler. The pose it’s a little more advance, but still a lot of fun either done with or without the snow boots. Again, especially in this pose, which functions not only as a hip and leg stretcher, but also as an upper body strengthener, please do not eat prior to striking it otherwise you may lose more than your balance. From low lunge, let the right arm and shoulder slide under the right hamstring and allow the right hand to rap around to the outside of the right foot. Once there take at least 10 breath to warm the hip flexor and then let the right arm lay flat to the outside of the right foot and allow the right knee to rest on top of the right elbow. While the right leg start sliding down and over sustained by the right upper arm and elbow, the left elbow, bent at 90 degrees, will catch the left hip crease sustaining the belly in a forward folding position so to allow a better balance. Once both arms are bent at 90 degrees and the right leg starts floating upward, this is the time to let the left leg float up and backward as well. To finish the pose, the head (helmet allowing) will also pick up and the spine will lengthen. 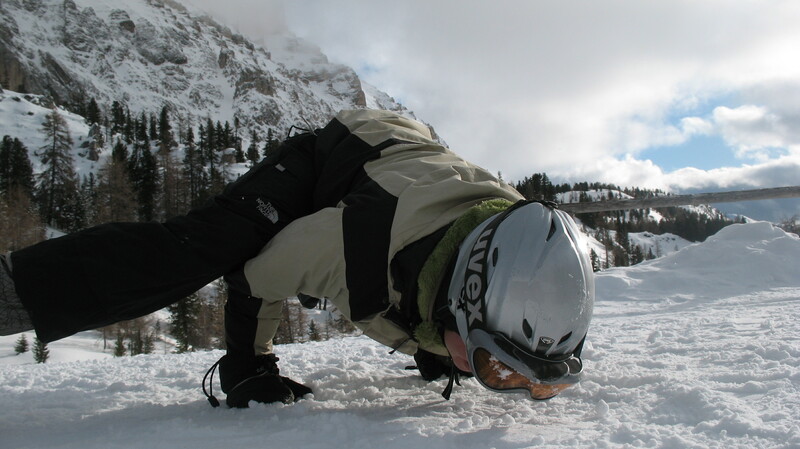 If, for whatever reason, your ski gloves are padded enough and you may choose to strike a Crow Pose do not forget to keep your feet and chip up even if the ski boots may weigh a little too much for your taste! To take Crow, make sure your palms are flat on the snow a foot in front of your knees and that your elbows are bent 90 degree. Then, gently hike one knee and then the other on the triceps allowing for gravity to be defeated. 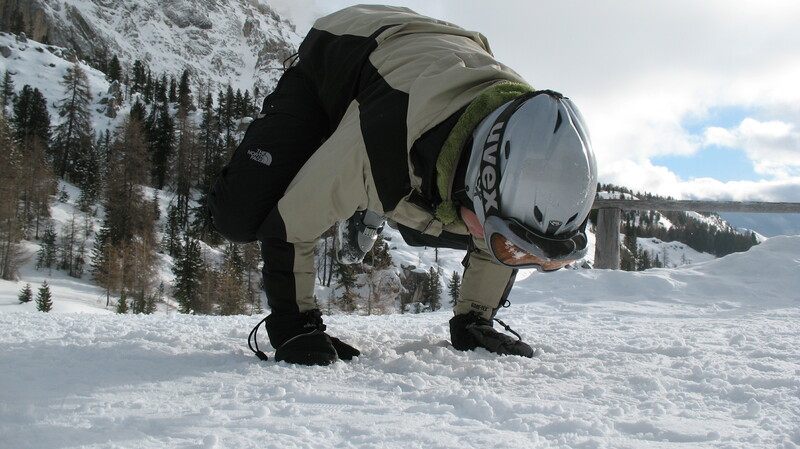 Once up there, do not forget to point the big toes *( in this case the front part of the ski boot) to one another, to allow an even better belly rising to the upper and lower back and therefore a better and more complete lift=arm balance. Whatever you do in Crow, do not over-bend your wrists. Whenever they hurt, stop and hoop down and back up again after a little stretching. Otherwise keep the palms slightly turned outward to avoid additional strain on the wrist on your second or third try. Just remember NO PAIN, NO GAME even in Yoga, or at least Après-ski! Hi blogger, i found this post on 15 spot in google’s search results. will end up, so having reasonably low bounce rate is important for improving your rankings naturally.